You know it’s been a while since I have featured a delicious juicing recipe but no better time like the present and I am bringing to you my own concoction – Spicy Bite Green Juice! I heard about Williams-Sonoma’s Juice Week and y’all know how much I love shopping in that place. I actually use several products purchased from there while juicing including my awesome strainer which removes all of the excess pulp. Also, if you didn’t know, Williams-Sonoma also carries a host of juicers to choose from so you can make your very own smooth and fresh juices. Check out their inventory of brands and various price points by clicking here —-> http://www.williams-sonoma.com/shop/electrics/electrics-juicers/. I hope everyone’s Summer has been awesome. I can’t believe we are about to head back to school in just a few short weeks. Unfortunately this Summer did not come with many or any vacations but we hope to sneak away with the kids for a couple of days to wind down before the Fall school season ramps up. If you have been following my blog for a quick minute then you know I have been receiving organic produce from Farmivore that I’ve been juicing on a regular basis. Well I felt like getting a little creative and spicing it up. This Spicy Bite Green Juice was just the right creation. It has a nice balance of sweet with a nice little “kick” from the ginger and lemon. Check it out – make it and let me know what you think. Instruction: Clean and prep all food for juicer. Send through juicer, put in a cute glass and enjoy! Feel the bite. What’s your favorite spicy juice to make? 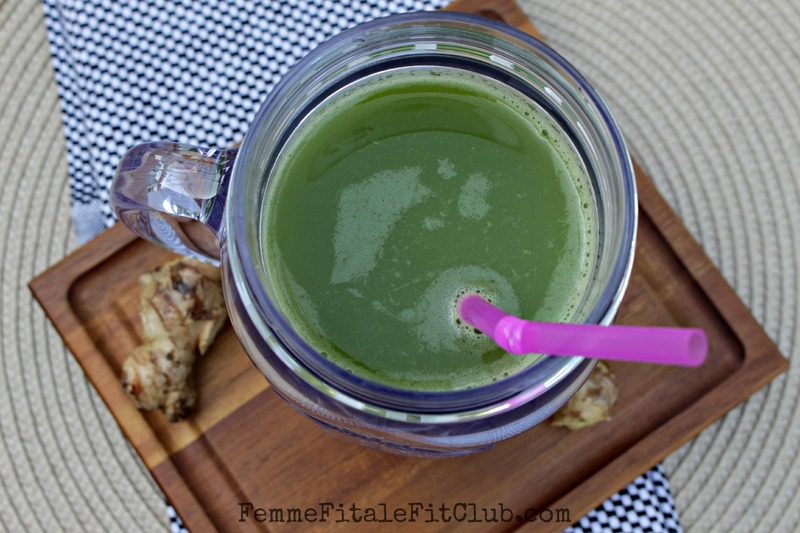 5 Replies to "Spicy Bite Green Juice Recipe"
That looks like a tasty smoothie and a great way to get those greens into my diet! How many servings does that recipe make? I’m getting more into smoothie-making now that my son will eat them with me, but I will eventually need to invest in a nicer blender or juicer! This recipe made 2 servings. But I drank both of them in 1 sitting. ooh that one does look good too! Oh that sounds like it probably had a NICE NICE little BITE with that jalapeno. I love eating jalapenos.